A retaining wall goes around the garage. This is behind the garage. 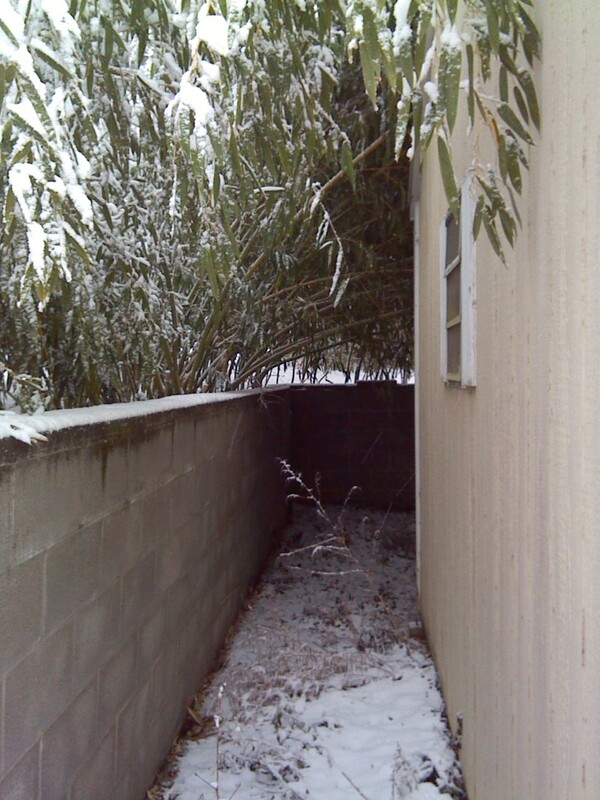 Beside the garage, looking out toward where my son parks his truck, it looks like this now, with the bamboo laid down with snow, like a tunnel. We have about 3″ on the ground, but the bamboo provides a canopy once it gets laid over, and the leaves keep the snow out, like an umbrella. I just went out to put birdseed on the covered back porch, the only place around here where the birds and squirrels know they can always get seeds that won’t get covered up with snow. They’re having a feeding frenzy right now, but later it is supposed to snow harder for a few hours. The squirrels will retreat to their nests then, and the birds need a place to go too, to get out of the snow and wind for a few hours. The bamboo provides them a haven, and by afternoon many birds will roost for a while in the bamboo, dry and waiting till it stops, to come out and eat more. If I walk out when it’s snowing hard, sometimes I can hear them in there chirping, and I’m careful not to go over and scare them away. The bamboo is beautiful, provides a place for the rabbits to hide from the red tailed hawks, a good place for birds to get out of the snow, and lots of poles for me to use as trellises for 12′ Lima beans and other things growing in the garden. I love my bamboo for so many reasons. Now my son’s truck is another issue. The bamboo keeps a lot of snow off his truck the same way, but it also sometimes makes his windshield wipers and antenna in question of getting ripped off if he doesn’t clear the bamboo off carefully before he backs out. It’s under there, you can see the tail pipe. 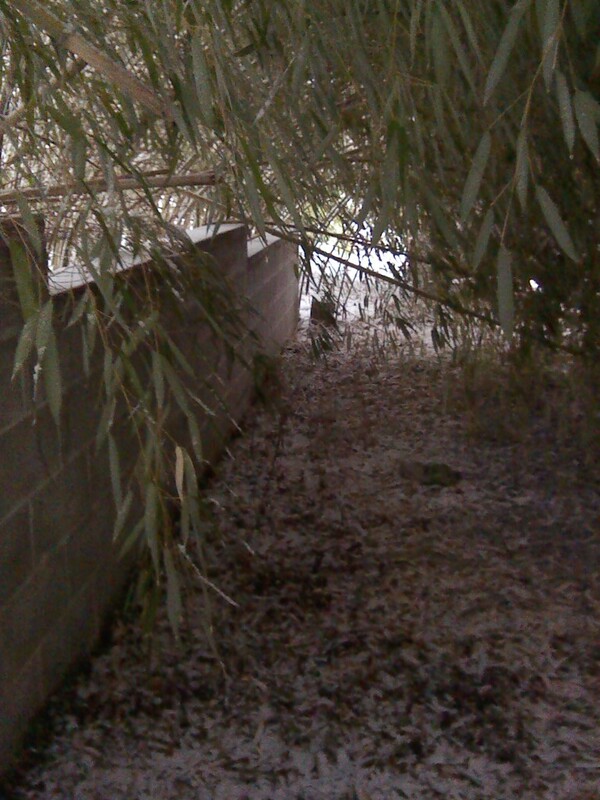 (But that’s all you can see until he starts to shake off snow from bamboo.) He’ll need 15 minutes to extricate the truck from the bamboo before he can leave for work. He likes it better this way tho, cos there isn’t a lot of snow for him to clean off the truck itself, cos it’s also under the snow covered bamboo canopy. Neat stuff, bamboo. But for the record, I still hate winter. At least we’re not in New England for the blizzard they are about to get. Me too, and I love being able to help them by providing what they need thru the winter. It keeps lots of birds around here, since I give them seeds and suet, and my son gives them corn next door. There are no skinny squirrels around here, either, lol. 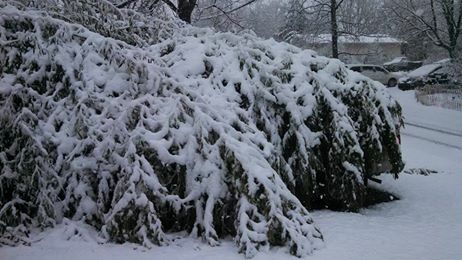 Did you get the heavy snow that went up the East Coast last night? If you did, I bet your bird refuge out by the garage has a no vacancy sign up today. I enjoy thinking about how you’re taking care of the critters there. 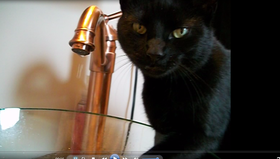 Would you like my recipe for suet cakes? We got more Sam but nothing like those poor folks up the way there. I don’t get to buy much fat here, but sure, give me your recipe and I’ll check it out. Thanks.